No not a lot of hype but it must be mentioned! 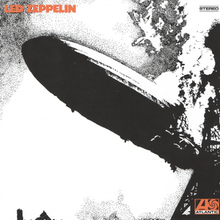 Led Zeppelin’s self titled debut album was released 45 years ago this month…thats 1969 for those slower in math and those struggling to get into their Monday groove. Yes the Led Zeppelin era is middle-aged and unbelievably, Jimmy Page, the bands patriarch turned 70 earlier this month. The 60’s belonged to the Beatles, but, the 70s were about Zeppelin right up to drummer John Bonham’s untimely death in 1980. Bonzo along with Jimmy Page, Robert Plant and John Paul Jones took rock n roll to new heights throughout the decade. Much like the aforementioned Beatles, Zeppelin’s stronghold on fans was achieved utilizing a variety of musical styles beyond just rock n roll. Zeppelin’s repertoire features among others; blues, country, psychedelia, classical, Indian, Reggae, Latin and mystical influences. Personally, I have been through many Zeppelin phases, from constantly listening to not listening much. Either way I can’t imagine a world without Zeppelin. Certainly, the quartet and most notably Jimmy Page’s guitar and compositional prowess have had a significant impact on my own music development. Not to mention all the good times with friends over the years featuring Zeppelin as part of the soundtrack! I was barely born when Zep debuted. Most my students today weren’t even born before they disbanded. Not to mention many of them were not even born in the same millennium Zeppelin prevailed. However, Led Zeppelin is still influencing young musicians today in 2014. Just taught a kid, “Heartbreaker,” this weekend. “Stairway to Heaven,” “Kashmir,” and “Over the Hills and Far Away,” are still staples of the guitar’s ‘must know’ landscape. When I am out performing, “Babe I’m Gonna Leave You,” always gets one of the biggest crowd responses. I always wonder what the shelf life of rock music will be. Technology and global media seem to have added to the life of the rock n roll era. Keeping it out of the dinosaur ‘symphony halls’ for now. As much as I want rock n roll to be around forever, I’d love to see what future generations/incarnations of popular music will hold? I hardly listening to Zep these days. Hoping I’ll come out of that phase at some point! I always enjoy playing The Rover on guitar. That’s a fun one to play. Well that was widdly haha. Do you know I’ve heard of him but I think that’s the first time I’ve ever actually heard him play. Quite enjoyed that. If I’m in a Zep mood these days it’s going to be Houses of the Holy or Graffiti. Kind of funky but it works with all the guitar sweeps and licks….I agree about Houses and Graffiti they were experimental probably their high water mark period.